At the beginning of Lesson 1 every day, all our students write something in their diary. They can write about anything they want, so the content of each diary is relevant to the students’ interests. We believe regular writing practice helps students to improve their English. Our teachers comment and write questions about what their students have written, so it is a good way for students to communicate with their teacher. When students finish their course they take their diaries home with them, so they have a record of how their writing has improved during the course. 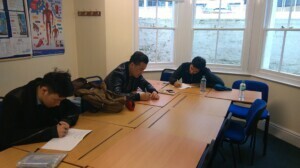 Some of our A1 students writing in their diaries. For more information about our adult courses, or to make a booking, click here.